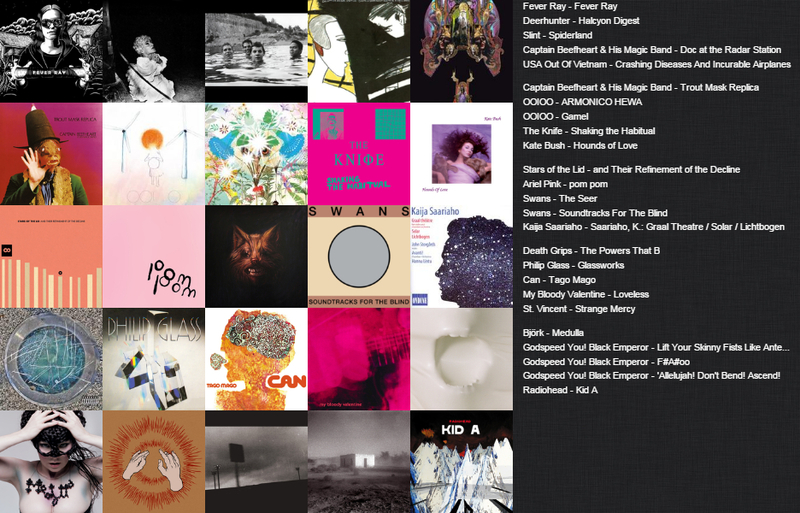 This is a quick and probably lacking favourite-albums-of-all-time-5x5-matrix that I made. 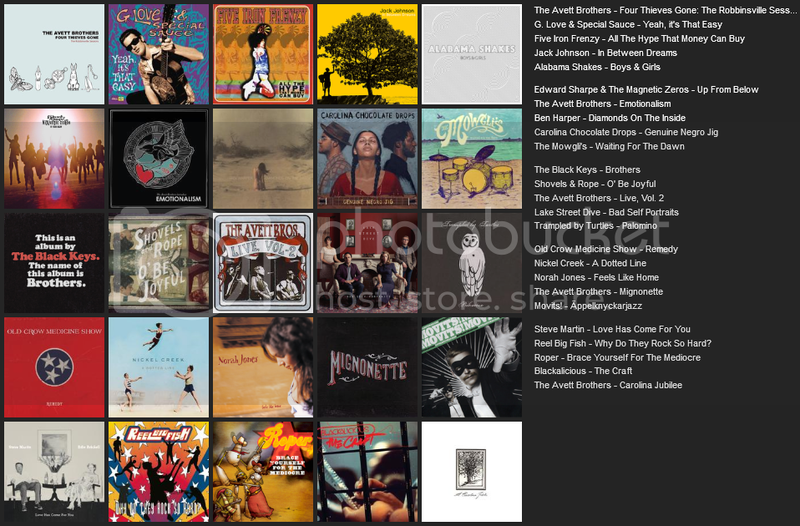 The idea of the thread is that you post your own matrices, whether they showcase music you've been listening to recently, your favourite music or anything really. Discussion and recommendation of music based on peoples matrices is also encouraged. Go! Did you just add the text on the side yourself? No, you can customize the layout if you click 'Click here to configure the layout of your collage!'! Oh, rad, thanks. Not sure how I missed that. I always stress about picking my favorite anything of all time, so this is mostly stuff I've been listening to recently plus a few older things. I chose a few albums to represent an artist not necessarily because I think its their best work, but because I like the artwork. Hey, you've got some solid picks in there, mostly classic rock, it looks like. I would've thrown in some classic rock representation, but I assumed one of the criteria was that we had to actually own the album. Oh yeah, I don't own a whole lot of albums @_@ I think I have like...a Led Zeppelin album and something by the Cranberries on CD. 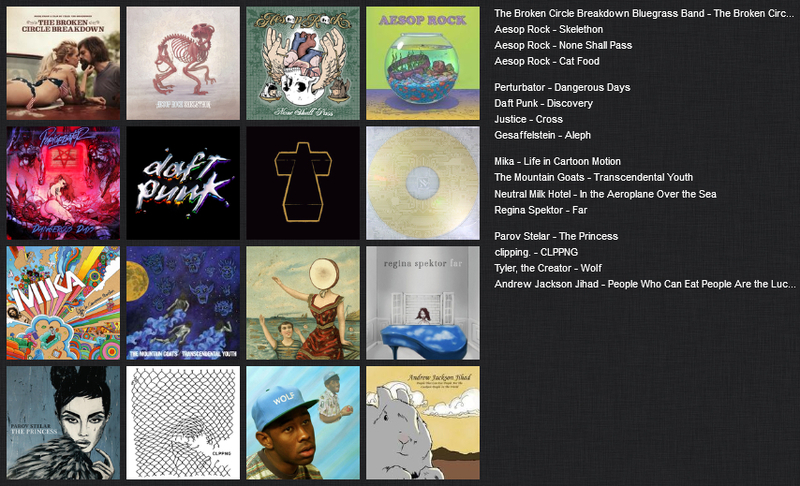 The first row is the Aesop Rock row, with a movie OST composed mostly of lyricless country to keep you on your toes. After that is Popular but Not Necessarily Pop, though Mika is pop for sure. Fourth is Miscellaneous, though most of them are pretty well-known as well. I've been led to believe that I would like Neutral Milk Hotel, but I haven't really listened to them. I have liked what I've heard from The Mountain Goats and Andrew Jackson Jihad. Man, that's such a great band name. Also I probably should've categorized mine instead of playing bingo with the Avett Brothers. @Slinky: You got some stuff on there I'm definitely into as well, mostly the grunge and Pink Floyd, and RHCP are pretty cool but I just can't get over Kiedis. I prefer Frusciante's solo stuff as well as Flea's various side projects, like Atoms for Peace with Thom Yorke and others. I'm gonna do a wild recommendation based of you being into Pink Floyd as well as some progressive rock: USA Out of Vietnam - It's post rock with elements of electronic music, sludge metal, shoegaze and whatnot, but somehow it still manages to sound a bit like Pink Floyd at times. @Inkling I think Neutral Milk Hotel is really good, IAOTS has got a rich sound with really interesting vocal performances and moving yet enormously cryptic lyrics. Jeff Mangum's voice is pretty "indie" though and some people can't handle that or the lo-fi production, but you should try it! Regarding your matrix: I don't know most of these, but I am surprised to see Movits! on there, I didn't know they were known outside of Sweden. Based of that I recommend you Timbuktu ft Damn! - Timbuktu is Swedens most popular rap artist and this song is from an album he did with the funk/soul band Damn!. @Ryz: Daft and Justice are house, not techno. That Clipping album is good as ****, are you into Death Grips? If you like Clipping you kinda should be. I like Aesop as well, though I only really listened to Labour Days, where does one go from there? Oh and I also used to be into Tyler, but I grew tired of his ****, I kind of think that him not allowing himself to be serious and sincere ruins his music. Nah, you don't have to own the album. I stream almost all of my music, buying it all is just not possible for me economically. I do own a record player though and I am slowly building up a vinyl collection. @Huck: Yeah, maybe that should be called the Electronica row instead. I've listened to Death Grips, and though I like clipping better Death Grips is good if I'm in the mood for it. Probably for Aesop listen to... Cat Food, Liesureforce, ZZZ Top, Crows 1 & Crows 2, and Coffee. 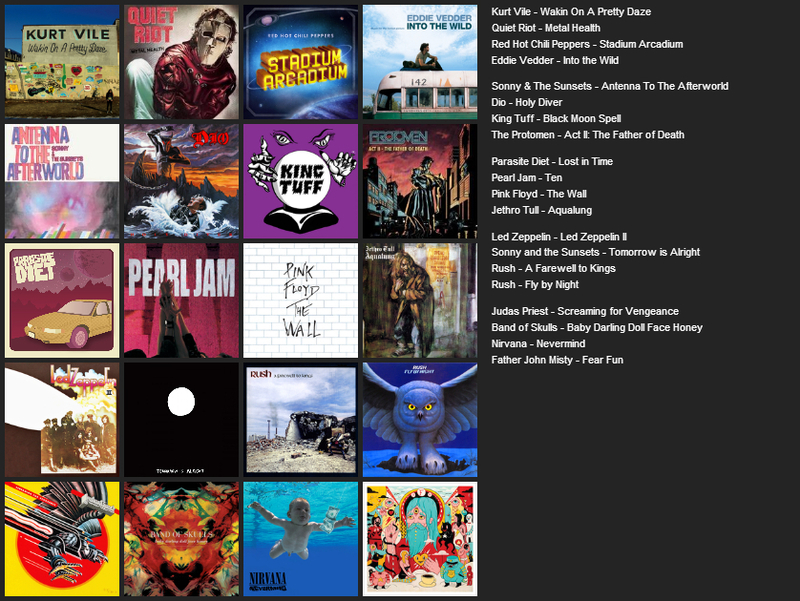 Those are songs, not albums, but I don't really listen to albums and I feel like AR's really good songs are littered through their albums pretty evenly.